apartment very bright, facing south overlooking the mountains, flow and return on skis, ski sun 1 located in the heart of the home heath, where you will find all amenities (caterers, grocery, newsagent, launderette , childcare, cinema, equipment rentals, restaurants, ...) and a variety of activities at your fingertips: During individual and group skiing, adaptive skiing, cross country skiing, off-piste skiing (ask the ski school) internship freeride snowboarding, swimming pool and ice rink. children are pampered in 'villages' that welcome from an early age (cheep-cheep club). in addition to skiing, you will opt for the feet to walk, snowshoe or snowmobile, the pool or the fitness in fitness clubs, ice rink, as well as the discovery of the heritage of the valley Bellevilles or classical concerts scheduled in the evening. package free hand opportunity to order or charge the card not directly on the Internet. the whole of the 3 valleys ski area is equipped with automatic control terminals, which allows you to keep your plan in your pocket. an open sports center from 10am to 12pm and from 14h to 22h: swimming pool, saunas, Jacuzzi steam room, aerobics, etc ..
Nice apartment but no check in instructions so we had no water and lights. Need check in instructions as we couldn’t turn the water on for 2 days. The light in the kitchen and bedroom does not work. L'emplacement est top. Avec le casier à skis à 8mètres et la piste 5 mètres plus loin, excellent. Près de tout ce qu'il faut et emplacement gratuit pour la voiture. Pour 4 personnes c'est chargé. L'intérieur pourrait avoir un petit rafraichissement. En général nous étions contents. Contact rapide et efficace avec le propriétaire! The apartments were perfectly located - directly on the slope in the quarter 'Les Bruyeres'. So in the morning you were very fast on the top and in the evening you could sit in the bar for apres-ski and then ski back to the aparts with no problem. Besides the perfect skiing location, there was everything we needed closely - restaurants, bars, a supermarket, the intersport, very nice aqua centre and ecole de ski. The quarter itself was very quiet. 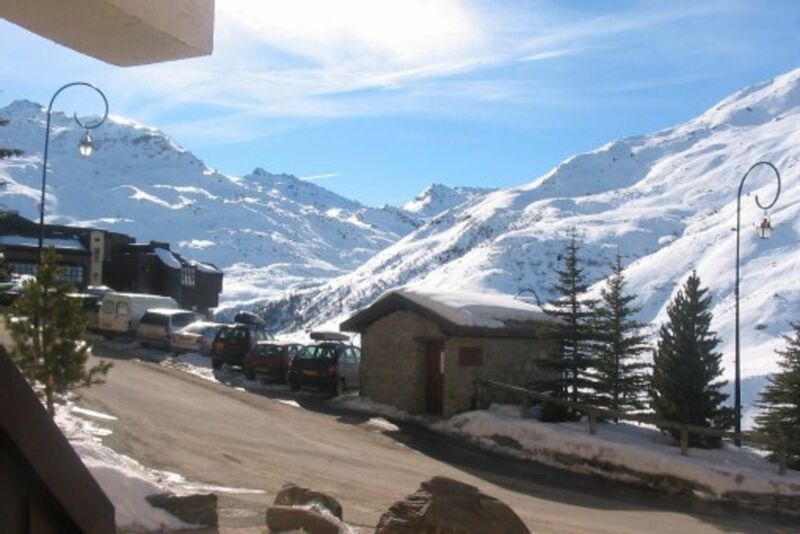 It was also convenient to go both to Meribel and to Val Thorens. The apartments are perfect for 2-3 people and have everything that you may need including all the stuff to cook (also raclette grill and fondue). The landlord was very nice providing all the necessary information. We arrived lately and departed very early but that was not a problem at all - the keys could be transferred at any time. So we were very happy to stay in the aparts and would like to go there again. Appartement propre et pratique pour 4 personnes, très bien situé dans un petit quartier agréable, très facile d'accès aux pistes, commerces et restaurants par ascenceur. Pas besoin de voiture. Bon rapport qualité prix. largest ski area (the menuires-st martin: 16020km trails, 37 lifts) with possibility of extension to the Valley (+ val thorens: 300km of pistes, 69 lifts), or for the more adventurous to the 3 Valleys (Courchevel and Méribel + 600 km of pistes, 200 lifts). les tarifs indiqués sont pour une semaine, possibilité de reduction pour un sejour superieur.